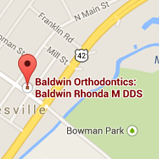 At Baldwin Orthodontics, we love making our patients smile! Dr. Rhonda Baldwin and our team members deliver personalized care, helping each patient attain the healthy smile of their dreams. Ours is an orthodontic practice that places you at the forefront. Everything we do is focused on your comfort and goals; we want you to enjoy all aspects of your treatment, and will ensure we exceed your expectations at every step in your journey. We know the difference having straight teeth and a confident, beautiful smile makes in a person’s life. Each of us loves spending our days helping create that change for people we care about. We’d love to do the same for you! To learn more about the treatment we offer, please schedule a complimentary consultation. We’re in Waynesville, OH, welcoming patients from Wilmington, Springboro, and surrounding communities. Dr. Baldwin and our team look forward to meeting you. It will be our pleasure to help you develop an amazing smile that will transform your life!